Casey has had a tough week or two. As I mentioned in previous posts she got pretty on her birthday. We started a 10 day antibiotic on her birthday and finished up on May 2nd. Casey did really good over the following weekend. However the following Monday (5/5) she had a really bad morning. We had to go to the neuro appointment and get an EEG but before leaving the house we noticed she was having a hard time getting enough oxygen and was really junky and congested. We had to put her on oxygen for a few hours that morning. By the time we were finished at the doctor she seemed better so we shut off the oxygen. 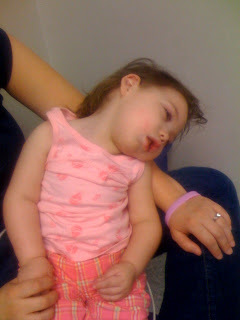 She was tired that afternoon, but she seemed to be breathing better so we didn’t worry too much. From the 5th on she has remained really congested and junky. We have been suctioning a LOT more than we usually need to. Casey was doing a lot of really deep coughing. Her saturations have been a little lower on average as well. We started doing additional breathing treatments hoping that they would help. The additional treatments seem to be helping (slowly) with improving Casey’s saturations. Wednesday Casey had a really good day. She worked hard in PT and played a lot. That evening she was really tired. I made a few comments to Tim about how much she was sleeping. Around 8:00 I put her down so that I could get her medicine and food. When I put her down she made a big cough (normal after moving her) and I started to suction her. When I put the tip in her mouth I noticed I was not suctioning the usual secretions, but instead I was suctioning blood. It was not as much as we suctioned this time last year, but it was enough to totally freak us out. The blood stopped after a minute or so and Casey seemed to be doing better. We were still freaked out, but she was saturating and relaxed. We were going back and forth on if we should sit and wait or rush to the ER. We paged all of her doctors and they all seemed to think it would be best for us to keep an eye on her and call back if she started bleeding again. We kept monitors on her all night and did not sleep at all. About 10:00 Casey spiked a fever. She was doing much better before, but the fever got her pretty worked up. She was crying a lot. We gave her medicine to bring down the fever. It took almost 2 hours to break but it finally did. Once it broke she went back to sleep and she slept through the night. Tim and I kept an eye on her and the other eye on her stats/monitors all night. After having a good night we decided to take her off the monitors and just let her rest during the day. We canceled her therapies and just kept her calm. Around noon she had a little blood, but not much at all. Then around 3:00 she had another big bleed (much like the night before). We called her ENT and tried to get in that day to have them run a scope and see if they could find the bleed. We were so worried that it was in a location that was not able to mend due to suctioning or just general moisture. Sadly the ENT was out on an ER, but they got us in Friday. Around 5:00 Casey had another big bleed. Oddly, she did not get distressed at all. Also, Thursday she did not spike a fever. Even her saturation was good. We went one more night with out sleep so we could watch her and the monitors. Friday we took Casey to see the ENT. He checked everything out and put us at ease. He said with her increased secretions and the fact that they have been so thick. Added to the fact that she has been coughing a lot. He determined that the blood was coming from her throat. All of the mucus took its toll. He told us to start giving her medicine that will thin out her mucus some. Luckily she has not had another bleed since Thursday evening. We have been keeping Casey as calm and quiet as possible to let her recover. We have an appointment with her pediatrician tomorrow. This is her 2 year appointment, but instead we will just use the time to go over what she is going through now. We will plan to start her therapies back up this week and just go slow. We are going to talk to Casey’s doctor tomorrow about possibly getting some day nursing to help out. Now that Casey is getting bigger it makes sense for us to get some help. I don’t think we need around the clock, but at least a few hours a week would help out a lot. We’ll see how that goes. I think that is about it. We are looking forward to a quiet week and a strong recovery. We will try to post more later as she gets better.